So I’m writing this a few days in the future, so bear with me if I can’t recall everything in detail. Today, Joe came over to assist in some airplane building, and I figured it would be a good time to start in on the right flap. And a closeup. Can't get much better than that. Oh, and with the rearrangement of the exercise room and guest room upstairs, I’ve been…”strongly encouraged” to get the airplane parts out of the living spaces. Notice she waited until after I put a ring on it to tell me to get my airplane crap out into the garage. Just kidding, she’s wonderful, and I’ve been meaning to get things hung up in the garage for awhile. 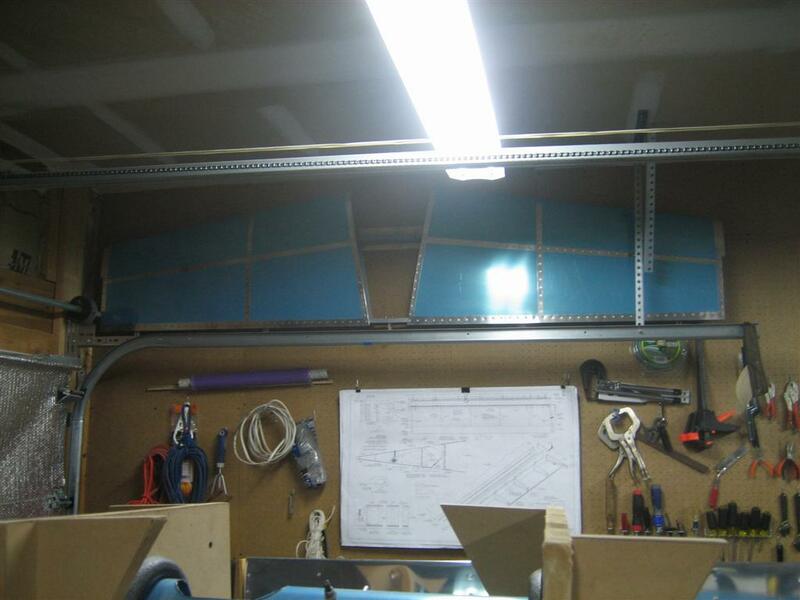 Here’s the horizontal stabilizer hung (very securely) with some red hooks through the pegboard and into some 2x4s. That's the largest piece that was upstairs. Joe showed up, so we started gathering the left flap parts. Here are the skins, the spar, and some of the ribs. We pulled the blue vinyl off everything instead of worrying about doing lines with the soldering iron. I think I've given up on that for good. We followed the directions carefully (except for the part where they want you to edge finish first. 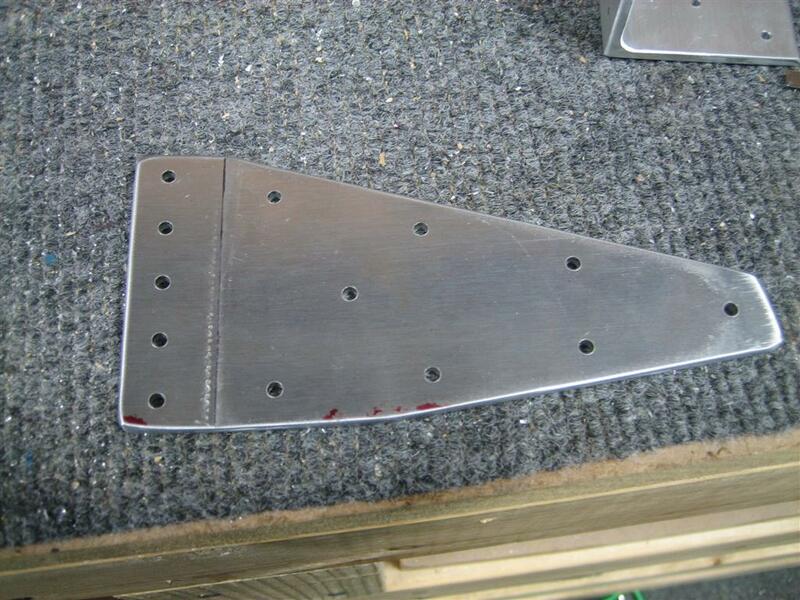 I like to do it before final prep) and started clecoing parts together and matchdrilling. 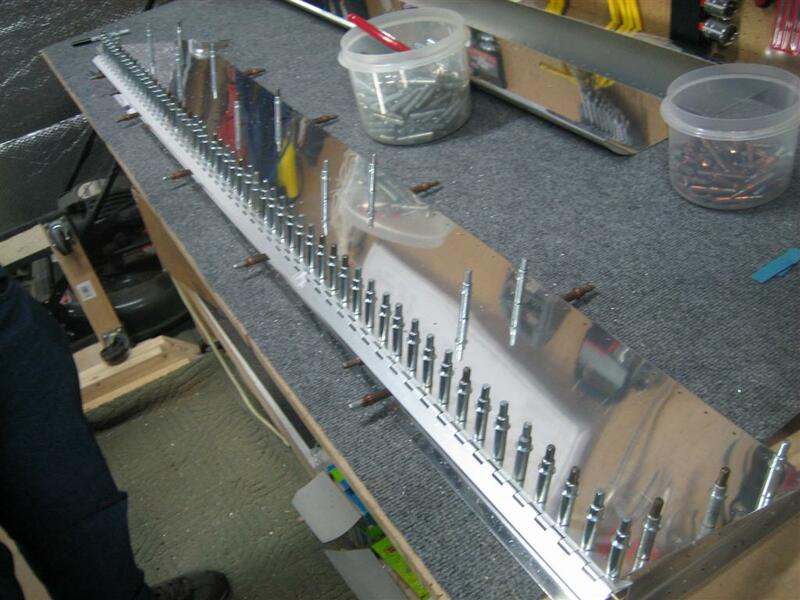 When we started working on the interior ribs, all hell broke loose. 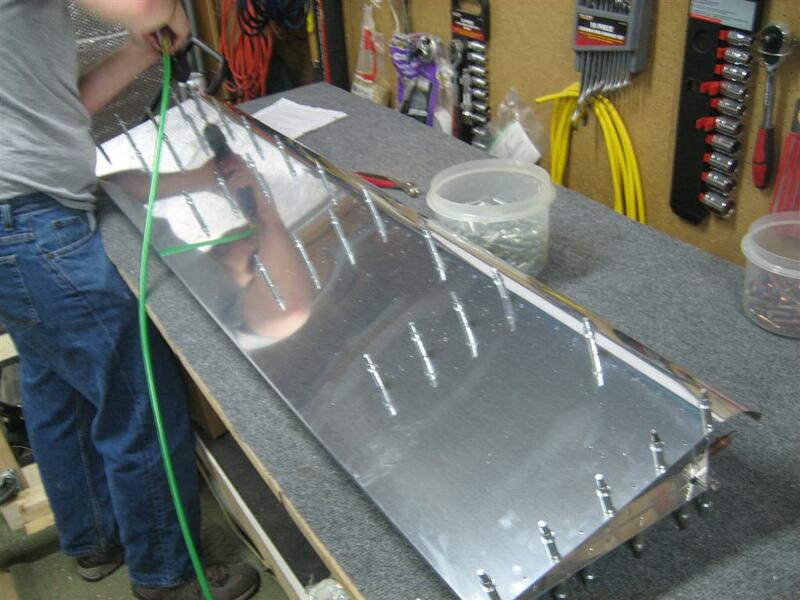 I had been carefully explaining that we’re building the right flap, so everything is reversed from the plans. 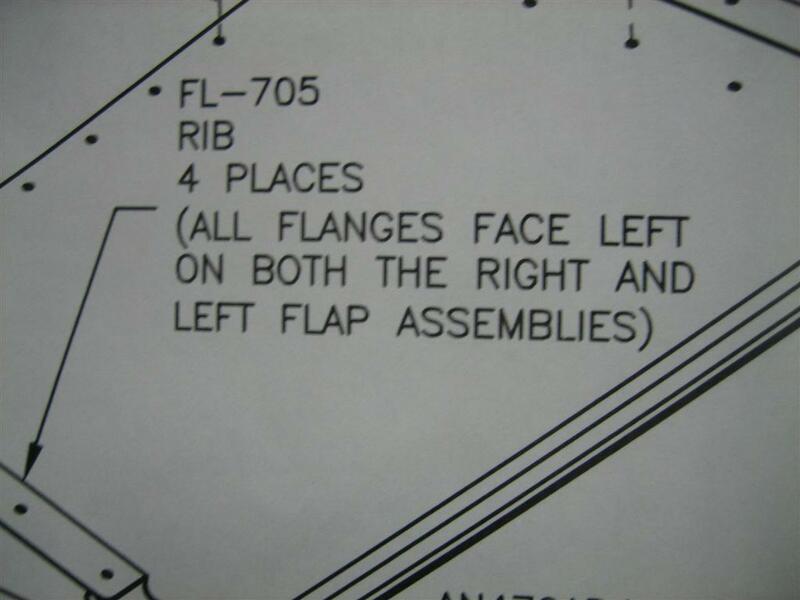 All of the flanges on the left flap pointed left, so we assumed the all the flanges on the right side faced right. Well, the holes weren’t lining up correctly. We sat for a few minutes and finally figured out that maybe I built the left flap with the right flap’s interior ribs, and that I could probably swap them here, too. I made a mental note to confirm this with Van’s support after the holidays when Joe noticed this note RIGHT IN THE MIDDLE OF THE FLAP DRAWING. Whew. That explains it. Glad I didn’t mess this up, too. 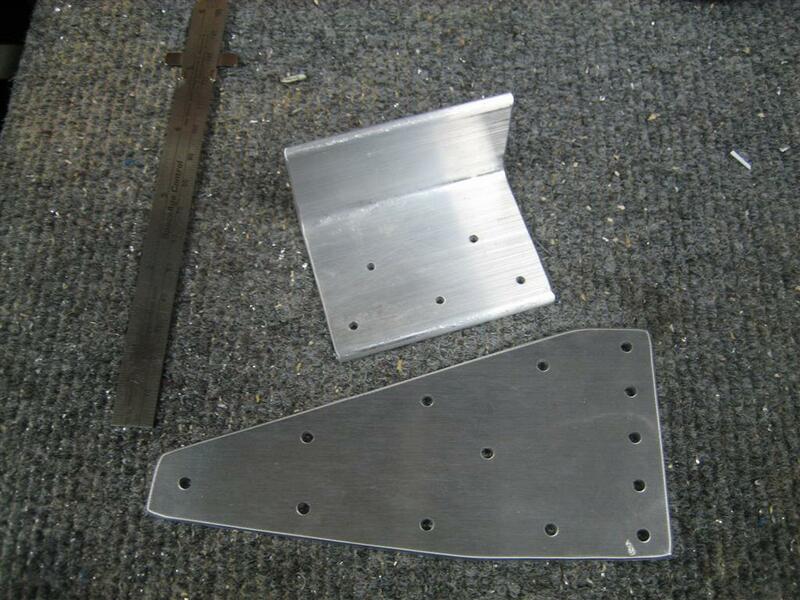 We flipped the flanges over (so they faced the left) and all the holes magically lined up again. Build on! A big note, right under my nose. 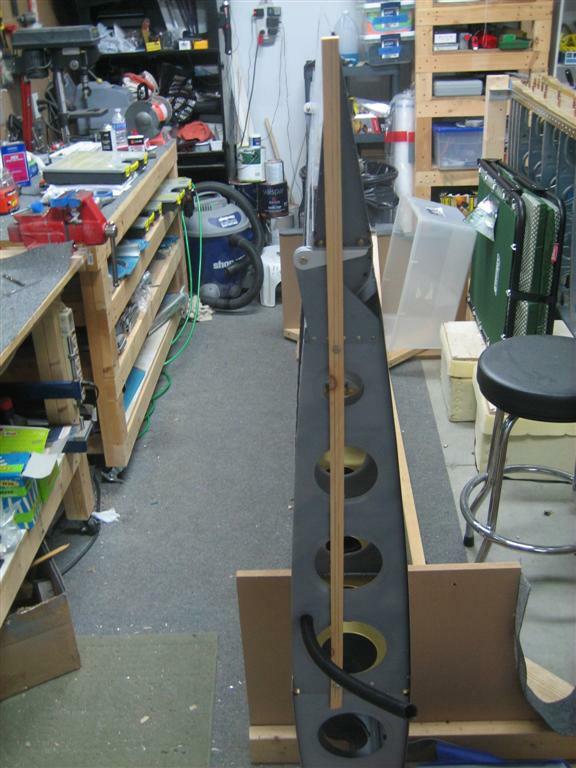 After matchdrilling the ribs and skins to the spar, we moved on to the hinge. 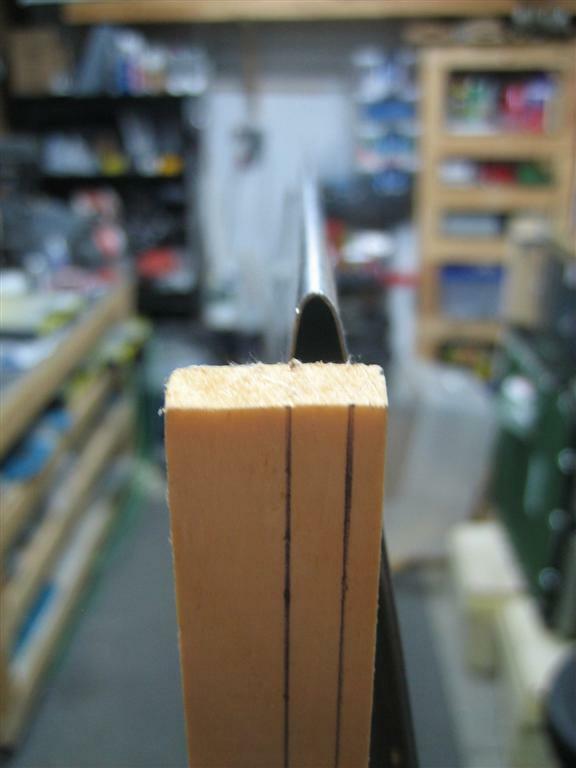 Picture below is the same procedure I used on the left flap, carefully constraining the flap to make sure there was perfect alignment. 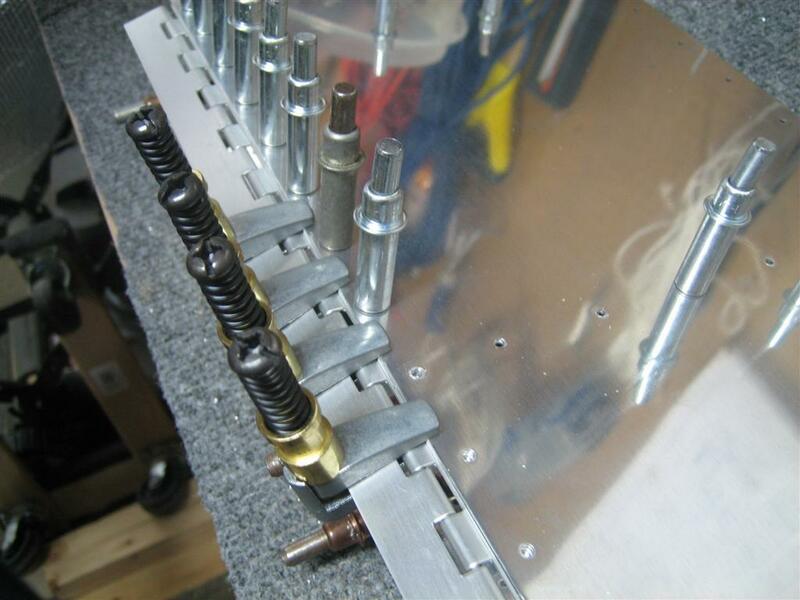 I used the four clamps in between each hole to maintain perfect alignment. After a few holes, we'd remove the clamps and verify we had good hinge movement. 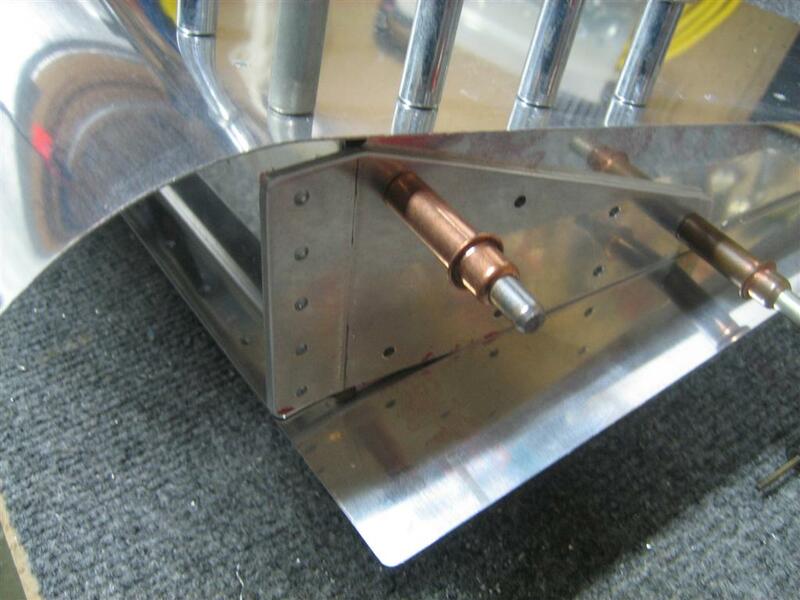 As we progressed down the flap, we got a little braver, and stopped using the sideclamps. 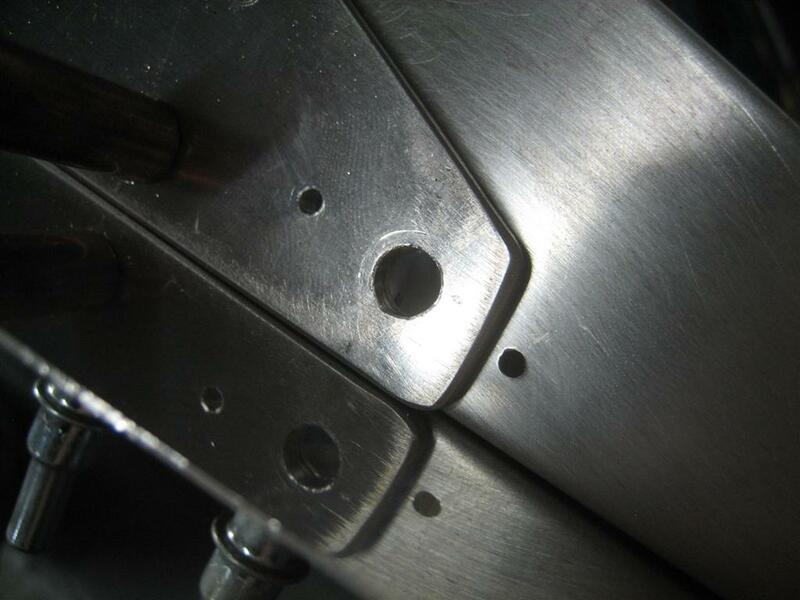 I had C clamps about every 10 holes, and drilled a hole next to the previously drilled and clecoed hole. We maintained perfect alignment the whole time, and it saved a ton of time not having to remove 4 clamps, check movement, add 4 clamps, drill 4 holes, cleco 4 holes, and then remove the 4 clamps. 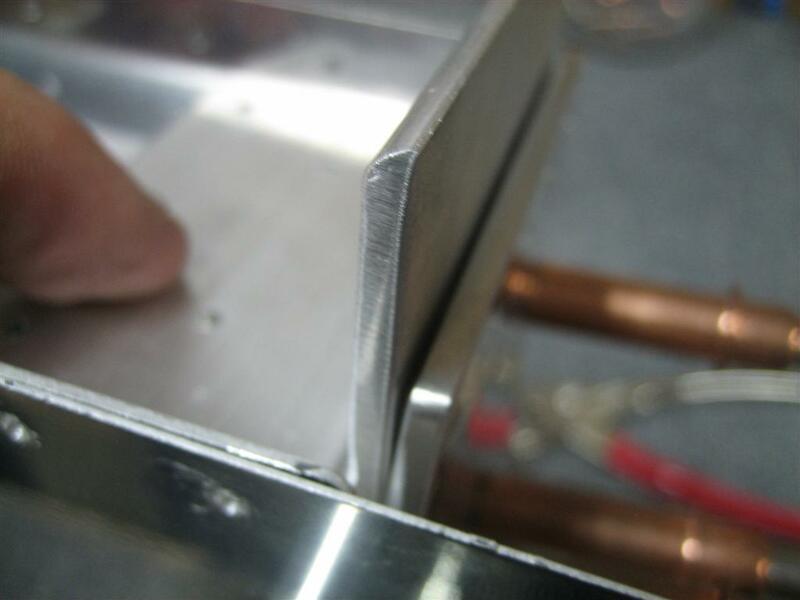 In no time, we had the right hinge drilled. Finally, we stuck the top skin on and Joe got busy matchdrilling. 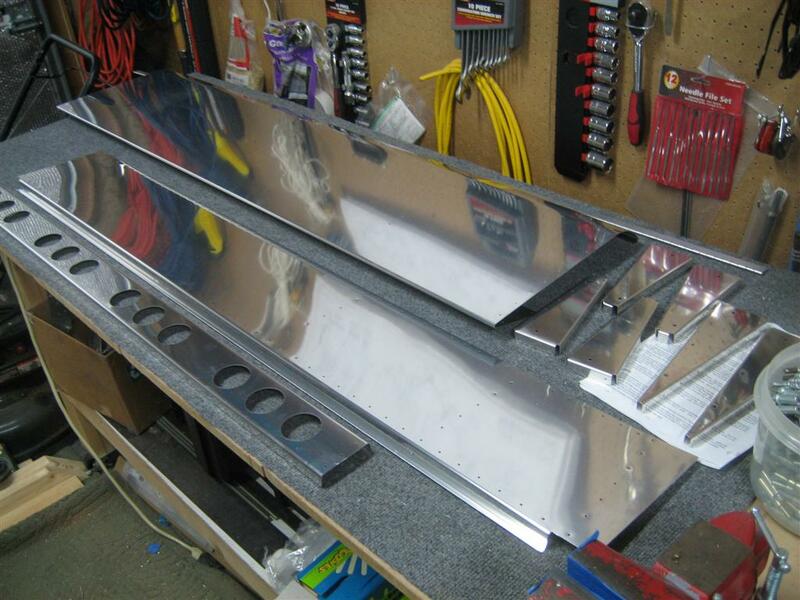 While he was busy doing that, I started fabrication on the flap angles (I forgot the part numbers, sorry). I didn't make the final cut on the angle yet, I'll do that later. The first try, I overbent it a little. See the wedge-shaped gap there? 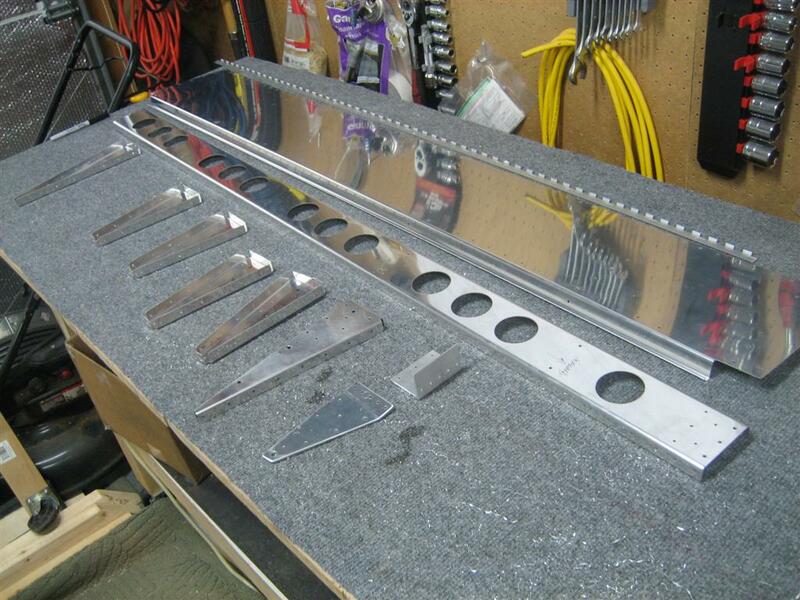 After a few more tweaks, it was perfect, so we started matchdrilling the angles to the ribs/spar. 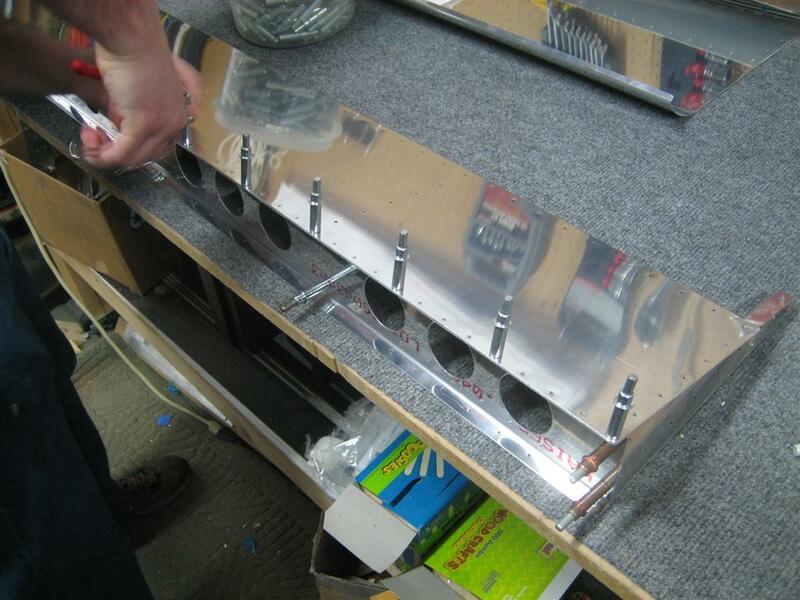 Then, we positioned and drilled the holes for the K1000-4 nutplate. Then, we disassembled everything and THOUGHT about started preparation for priming. Want to start the tedious prep work? No way, it’s lunchtime, and Joe had to go meet his better half. 3.0 hours with Joe today. Since we really didn’t work simultaneously on anything, I’m going to count it as straight time. I’ll count his time as double when we aren’t watching each other work. See you guys next year! This entry was posted on Thursday, December 29th, 2011 at 6:00 pm and is filed under Wings. You can follow any responses to this entry through the RSS 2.0 feed. You can leave a response, or trackback from your own site.